Dimitri is the youngest brother of what I am going to hopefully coin as a “CT jiu jitsu family dynasty.” He and his two older brothers are all well-respected, and I have had very limited, but memorable, rolling history with his siblings. I learned at the tournament that while Dimitri has trained for many years, he has only recently started competing because of his age (which I believe is 16 or 18). His older brother told me he motivated him to enter the tournament to get back into it after a brief lull in training. I have to say that, despite the fact that it’s possible I could be Dimitri’s father without being a “teen dad,” (a situation I might have to start getting used to) I was anxious about this match. As with my match against Alex beforehand, my focus from the start was to remain grounded, and see what Dimitri would attempt for takedowns. Gripping each other is more difficult in no-gi, and wrestling takedowns are more common. Eventually, I began to impose my game from standing, trying a two-on-one wrestling takedown Jay showed us recently. (Sure, try the new move for the first time at a tournament having barely ever done it.. all the white belts are doing it, why not me?) Watching back, I see that I should have pulled Dimitri forward first, if I really thought I’d grab that lead leg. 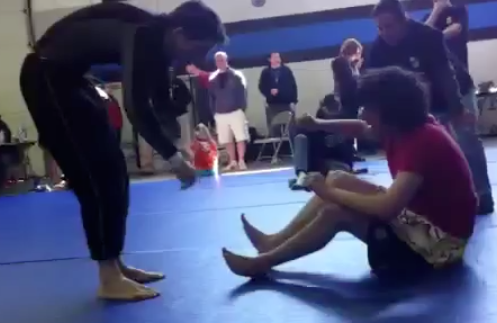 I also wonder if it didn’t help that someone yelled for me to ankle pick just before I tried to. A frankly pathetic attempt at the same takedowns I attempted more expertly on Alex ended up transitioning into a weird ankle-knee takedown finally, leaving me popping up into his open guard. Immediately I knew my premonitions were correct about his flexibility, and unique game. Some people’s legs can be controlled by the foot, because of natural tension through the leg. For people like Dimitri, grabbing the foot is like grabbing one leg of a three-foot-long slinky and trying to move it around where you want to. This game is difficult to deal with, and while I tried to, Dimitri went for what appeared early to be favorite attacks, triangles and reverse triangles, with those legs. Instead, we ended up in a weird upside-down, backwards reverse-cowgirl thing, in which I just tried to establish base and wait for an opportunity to not be there. The opportunity came when I attempted to razor the arm he’d left on my shoulder. He got the arm to bend, and when it was in a kimura position, he was compelled to roll out to guard again. More slinky-fighting ensued, and I kept back from striking distance, closing only when I thought I had the grips to make a side-mount happen, repeatedly finding out I was wrong. Passing open guard from further back is a strength for me, so it was a great match-up in this position. At one point, while trying to find the base to spin from north south back to a guard attack, Dimitri slapped my face, but immediately we both jested about the innocuous blow, and restarted. Ah, sportsmanship. Lately, I’ve been working on passing by stepping on one of my opponent’s feet, pinning it, and then just stepping around guard. It’s more effective than it might sound. One of these attempts on Dimitri ended up setting up my other, signature, slide-across pass, which finally put us in a conventional side mount. Did I say conventional? This kid had some crazy set-ups. I was super conservative from side-mount, acutely aware that Dimitri could catch a reverse triangle from bottom if I left any room for it. (Check out 4:30 on the video for an example of an attempted set-up using a rubber leg). I did try for a quick moment to switch to face him, where I have a new favorite armbar, but felt myself losing the position, so retreated back to all fours. Well, with his near arm shot underneath me (ostensibly for that escape) but raised to conform to my stomach and allow him to interlace his hands, I started to realize that the near elbow was off the ground, and the near arm, my attack point. 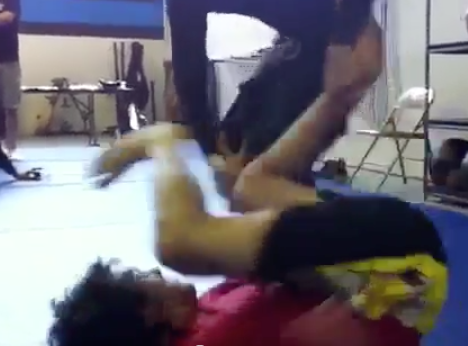 I set it up, and had to sort of meander into position, but it did put me in armbar-setup position. Momentarily, I had to fight off a crazy leg which sprang over my head, apparently providing some laughs because of the facial expression I made (which I don’t recall, or see). From here, I took my time, and by lacing through his arms, was able to finish the technique cleanly and safely for Dimitri. Immediately afterwards, like a true sportsman, Dimitri’s brother was the first on the mat with a huge smile and a congratulations. Man, I love this community. I have to credit my time with training partner, Matt Daly, for my becoming aware of the dangers of attacks from bottom side-mount.